Designated an important cultural property of Japan, Matsuyama Castle—one of the twelve preserved castles in Japan—is a beautiful piece of Japanese architecture which was constructed on Mount Katsuyama between 1602 to 1628 by Kato Yoshiaki. But beyond its dreamy appearance, Matsuyama Castle served as a formidable fortress for the Katoh, Gamoh and Matsudaira family between 1603 to 1868 and was crucial in deceiving enemies into believing that they were attacking the residence of the feudal family but in actuality, were being led to their deaths. If you are visiting the Ehime Prefecture soon, you will not regret catering some time for the Matsuyama Castle. 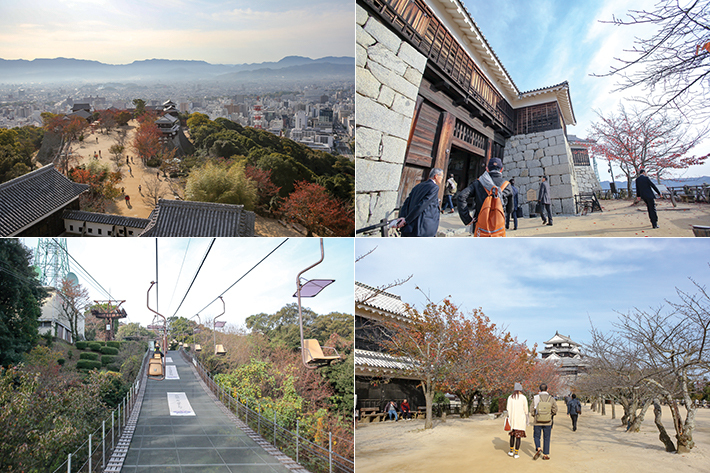 As the Matsuyama Castle was built on a steep hill, the best and easiest way to access the castle would be to take the chairlift. Do note that the chairlift will not bring you directly to the Matsuyama castle and that you will need to walk a further 5 to 8 minutes uphill before reaching the edge of the castle. Built by hand from stones sourced from the Yuzuki and Masaki Castle and their surrounding areas, the Matsuyama Castle is a perfect example of a feudal castle as its defense is situated at the top of the hill, which can only be accessed through the multiple guarded gates. In addition, there are various “windows” in the castle’s walls which allows archers an excellent view for targeting oncoming enemies. Separately, the Matsuyama Castle is widely regarded as one of the best places for cherry blossom viewing in Japan as the castle’s grounds are home to more than 200 cherry blossom trees. But what we were absolutely smitten by was the grand panoramic view of the Ehime Prefecture, Seto Inland Sea, Mount Ischizuchi and the castle’s grounds, from the top of the Matsuyama Castle. The views were so mesmerizing that we could not help but feel as if we had stepped into a fairytale. Admission to the Matsuyama Castle costs ¥510 per pax and an additional ¥510 for a round trip for the chairlift. Read our 5D4N Shikoku & Setouchi itinerary featuring 19 reasons to visit this beautiful region.